On Sunday, Sept 12 Woodland Chapel celebrated our Meditation Garden and unveiled the future sign naming the garden for Rev. George Powell. 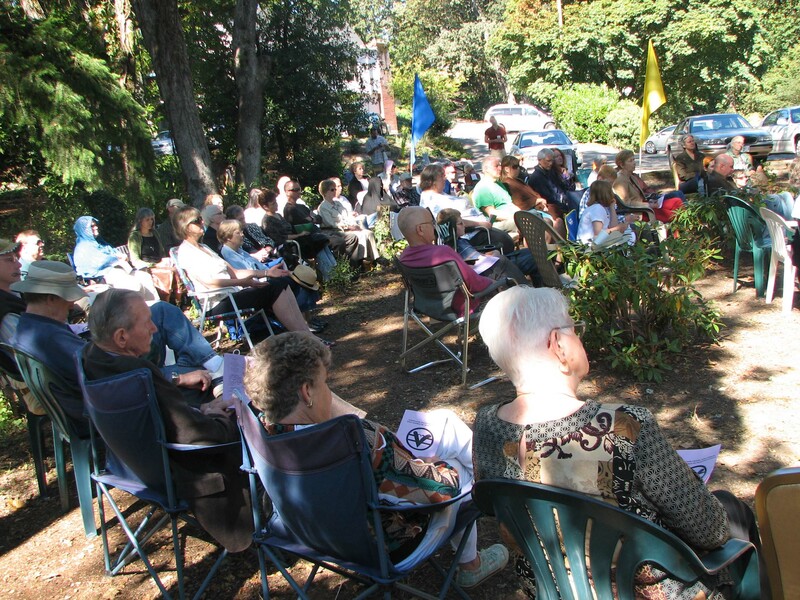 The sunshine and warm weather brought many people who sat among the trees enjoying music and inspiration. The welcoming music of “Mirrors”, Lorena Ferry and Jeff Icovino met those attending, adding to the harmony of the setting. Rev. Don Kerr began by telling about the meditation garden’s history, then related a Calapooya legend of the native people using this same space next to Pringle Creek. The legend was accompanied by the beautiful sounds of Native American flute played by Brian Bridges and a huge native-American-made drum played by Caleen Thorsen. Rev. Mary Midkiff then talked about “The balancing of Spirit and Matter”. Many people pitched in to create a beautiful experience, and it was agreed that this was the first of many outdoor services to come. This entry was posted in meditation, outdoors. Bookmark the permalink.